New. Trade paperback (US). Glued binding. 336 p. Audience: General/trade. New in New jacket. Rock That Is Higher, The. 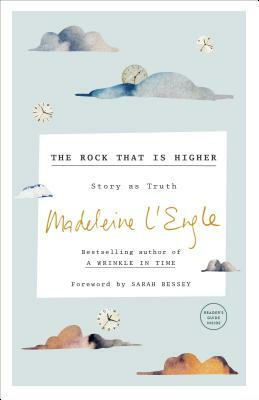 L'Engle wrote The Rock That is Higher in the aftermath of a terrible automobile accident. It would appear that the lengthy period of recuperation gave her time to muse over Christianity's place and roll in her life and life in general. L'Engle does not separate the spiritual and secular, but sees the ways in which the two are closely knit together. She sees God and Jesus as an intricate part of home, family, love and truth in the lives of believers. L'Engle comes from a line of storytellers. She recognizes how humanity uses stories to enrich, explore, reveal, and teach. When reading and listening to stories Christians can see God in the truths that are uncovered. She makes the point that truth is not to be confused with facts. Fiction can be a wonderful vessel for truth. After all, didn't Jesus use parables to reveal truth? While theologically I am not one hundred percent aligned with L'Engle. She graciously allows and encourages personal exploration and interpretation. Her writing gives the reader much to think about. This book is written in a very personal style. The reader feels as if he or she is sitting across the table from the author with a cup of tea and an open family scrapbook. L'Engle reveals intimate moments from her life's experience in very poised prose. I thank NetGalley and Crown Publishing for providing me with a copy of The Rock That Is Higher in exchange for my honest opinion. I was under no obligation to provide a positive review and received no monetary compensation.